I was born at the end of 1960. Among my earliest visual memories of media experiences are televised coverage of the Kennedy funeral procession—specifically, the flag-draped horse-drawn coffin and oblique overhead view of the cortege—and images from Osamu Tezuka’s animated television show, Astro Boy. Both can be dated to late 1963. Specifically, several images from the title sequence were emblazoned on my brain. Recently the entire series became available on DVD through Madman Entertainment in Australia. I bought the first 52 episodes in a boxed set. Because I have been spending lots of time with students talking about screen sequences, I got a couple of DVDs out to watch a few episodes. Meanwhile, what is it about anime and audio? The voice actors and sound designers in anime shows always drive me bonkers, and this is the granddaddy of them all. (I have a son who is fond of Naruto, the sound of which can drive me out of a room in nothing flat.) How is it possible to deliver a track that is both stentorian and infantilizing? And of course the visual style can mimic this as well, but Tezuka has a terrific range of characterization. From my perspective, the visuals are best enjoyed with the audio on mute. But I’ll also confess that the pacing is such that whenever I actually do sit down to watch an Astro Boy episode—with or without audio—I almost always fall asleep in the middle. But that title sequence is nice and tight! Worthwhile viewing for our screen composers. Especially since the animation is pretty limited in spots. 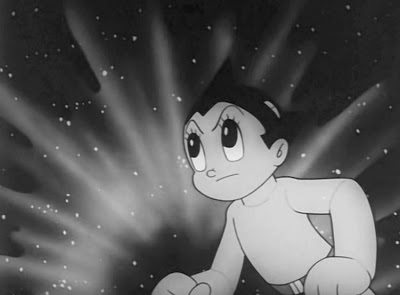 Synopsis: Astro Boy is introduced via tight shot in front of a pulsating background, then takes off to begin his adventures. Over tbe course of several shots he fights Colosso, a giant robot who makes an appearance in Episode Two. after which a borer machine roars up out of the ground to drill the now-compromised robot straight through, only to be dispatched itself by our boy. Subsequently Astro Boy punches out a row of bow-tied Klansmen like a row of dominoes; faces a battery of criminals with rayguns, plus a few more in tophats and tuxedoes, upon whom he drops a small jailhouse. Finally he zooms across town to pose for the closing shot. I’m posting stills because I think you get a clearer sense of planning through them. Osamu Tezuka, Mighty Atom (Astro Boy in English), 1963. The show ran in Japan from 1963 to 1966. An American version dubbed in English ran on NBC during the same period.